Must-read article! Those of you who subscribe to the Cruciverb-L mailing list have already heard about this. A guy named Saul Pwanson (honest!) built a database that could compare thousands of published crosswords and calculate the degree of overlap between any two puzzles. Turns out a surprising percentage of puzzles edited by Timothy Parker (for USA Today and the Universal Uclick puzzles syndicated online) replicate themes from previous New York Times puzzles. Oliver Roeder wrote about the plagiarism scandal for statistician Nate Silver’s site, fivethirtyeight.com. Will Shortz is quoted: “To me, it’s an obvious case of plagiarism. It’s unethical, and I would never publish a person who plagiarizes another person’s work.” I agree. Long and busy day, not enough sleep, zero motivation to blog because I could just go to bed. So! Random observations follow. 26a. [One speaking the language Plautdietsch], MENNONITE. Neat clue! Never heard of the language, but figured it was German/Deutsch-related. 38a. [Bush native to the South], JEB. Bye-bye. No more sojourns to Iowa and New Hampshire, bub. BARE IT ALL, THE HEIRESS, I’LL BE THERE, CRIME SCENE, PETER FALK, HERE AND NOW, ARM-WRESTLE, I LOVE L.A., SILENT TREATMENT: all really good fill. 46a. [Party divider], AISLE. Political parties on opposite sides of the aisle in Congress, e.g. 1d. [Choices in the baby department], TALCUMS. No, no, no. Plural TALCUMS, I don’t like. And baby powder that’s actually safe for babies has cornstarch, not talcum powder. This is what happens when your editorial crew does not have children, I guess? Inhaled talc can cause lung disease (and if you’re not a baby, don’t use talc on your “bits”—there is some data suggesting an ovarian cancer link to talc). 5d. [Lead-in to “Los Angeles” or “New Orleans”], NCIS. Come on! When I LOVE L.A. is in the grid, please don’t put “Los Angeles” in a clue. 3.65 stars from me. Good night, folks! I had a copy of last week’s LAT Saturday puzzle in my hand for some reason, and I noticed my solving time is also exactly the same as today’s 10:06! I solved last week’s in 10:05. Without looking up the actual data, it seems as if most of my LAT times are under the ten minute mark; I can’t say the same about my Newsday Stumper times! (Most are well over 20 minutes!) Are the puzzles getting harder? Am I getting slower? Is winter depression not letting go of it’s vice grip on me?? Hard to say. 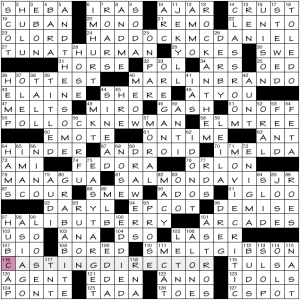 Having said all that, these LAT are great Saturday puzzles – certainly a far cry from the shoddy USAToday puzzles that are being called out! Today’s entry by Barry C. Silk is right in line with some of his other themeless puzzles. 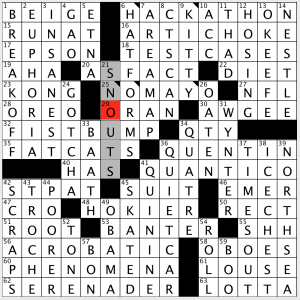 A good challenge, a few obscure trivia facts, and a wide-open grid. I also liked the nice bundle of Q’s near the middle; often it is hard to include just one Q in a puzzle, let alone three in close proximity! For that feat alone, the rating jumps to a 4.5! 6A [Software developer’s get-together] HACK-A-THON – This makes me think of the “Hack-A-Shaq” technique that was used in basketball games a few years ago to take advantage of Shaquille O’Neal’s horrendous free throw shooting skill. There are a few centers today (Andre Drummond, DeAndre Jordan, and others) in the NBA who shoot just as badly, if not worse. My theory? Their hands are just enormously large! 36A [WWII correspondent Reynolds] QUENTIN – This is one of the “Q” answers, but this is extremely obscure, in my opinion. He does exist, but he has been dead for over 50 years! 42A [Parade honoree, briefly] ST. PAT – This is almost REALLY timely. Instead, it is just good timing! 60A [They’re observed] PHENOMENA – I remember smiling when I got this answers. Always a slight challenge when a plural doesn’t end with an S! 6D [Millinery blocks] HAT FORMS – This is familiar to me because my sons watch How It’s Made CONSTANTLY!! There are quite a few instances where they are making some sort of hat! 13D [Michael of “Michael Clayton”] O’KEEFE – This would be hard enough if the clue was [Danny Noonan portrayer in Caddyshack]. As a side bit of trivia, I grew up near an O’Keefe Street. I know; who cares! 31D [Dana ___, co-star of the original “Invasion of the Body Snatchers”] WYNTER – Also obscure. But remember – I am uncultured! 38D [Beer container] ICE CHEST – Now I am getting thirsty! I haven’t had a beer in literally months! 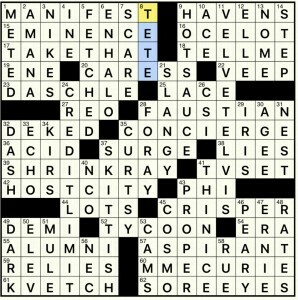 43D [Lozenge] TROCHE – This is an example of an obscure word, but on a hardy crossword solver should learn! Another fun puzzle from Barry, who I am a big fan of. Until Tuesday’s LAT! So I tried a new tactic this morning: I started the puzzle when I first woke up (at 6:00 am or so), got hopelessly stuck, then instead of going for a run, I went back to sleep! I must have been exhausted, because after waking up again (at 10:30 am or so! ), the puzzle, although still extremely difficult, began to fall. I had to check the spelling of Tom DASCHLE, but there were no errors I had to check for. There were, however, lots of head-slapping moments when the correct answers were finally solved! Those are primarily what I will list below. Brad is a genius! 4.7 stars today! 32A [Deceived, as a Duck] DEKED – This I actually filled in first, I believe. Yes, I was confused for a bit, until I saw Duck was capitalized! We are talking the Anaheim Ducks here, and a deke is a hockey fake. 39A [Sci-fi device] SHRINK RAY – Yes, I was thinking STUN GUN or some sort of LASER. Great entry! 42A [Winner of some Olympic competitions] HOST CITY – Yes, I was thinking some sort of Olympic athlete!! 45A [Produce bin] CRISPER – I had CHILLER in here, then an almost painful “a-ha” moment when I remembered the drawer that every fridge has! 60A [First female prof at the Sorbonne] MME. CURIE – I thought early on this might be her, then I saw the abbreviation in the clue! 62A [What some looks cure] SORE EYES – Get it? “A sight for SORE EYES?” Wonderful! 11D [Exemplar of kitschy art] VELVET ELVIS – OK, I have never seen one of these, but my wife is familiar with them. In Googleing the image, you can even get one with Jesus on it as well! If the two most important people in your life are Jesus and Elvis as 1 and 1-A, you deserve tacky art! 13D [One of its “Welcome to” signs is a giant gold pan] NOME – This one I definitely got after I slept on it! 24D [Plastic cap] CREDIT LIMIT – There is a bruise on my head from the head slap for this one! Best clue of the puzzle! 35D [Lower yourself, in a way] CURTSY – Yes, I was thinking BERATE or something similar! Another great clue! Totally enjoy solving Brad’s Stumpers! I know his and Longo’s are easily the most difficult!! Until next Saturday’s Stumper! Not for the pun-averse. Here, what keeps these cohesive—in addition to their lateral lines—is the consistency among clues and answers. Each entry is the full name of an actor, with the first name changed to that of a similar-sounding fish, and each clue provides context with a piscinely punned movie title, one that said actor actually appeared in. Starfish? 24a. [Sought-after star for “Gar With the Wind”?] HADDOCK MCDANIELS (Hattie). 27a. [Sought-after star for “Kill Brill”?] TUNA THURMAN (Uma). KRILL are tiny crustaceans, in case you were wondering. ‘Shellfish’ aren’t ‘true’ fish, but I’m sure you knew that. 40a. [Sought-after star for “The Codfather”?] MARLIN BRANDO (Marlon), Sighted that one off the starboard bow half a mile away. 55a. [Sought-after star for “Cool Hand Fluke”?] POLLOCK NEWMAN (Paul). George Kennedy, who won an Oscar for his role as ‘Dragline’, died this past Sunday. Also, I had pollock burgers for dinner last night. 81a. 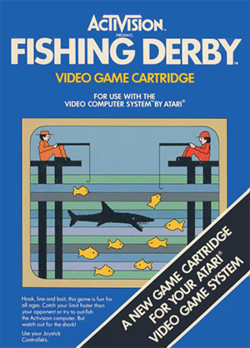 [Sought-after star for “Porgy and Bass”?] SALMON DAVIS, JR (Sammy). PORGY of course is also a kind of fish. I’m positive I included an image of one in a write-up here some years ago. 97a. [Sought-after star for “Die Another Dace”?] HALIBUT BERRY (Halle). 110a. [Sought-after star of “Mad Mackerel”?] SMELT GIBSON. How much nutrition one derives from these is questionable; think what you will about puns, but I’d say these are high in omigod, please! Brain food, eh? The “sought-after” repetition certainly evokes a fishing expedition. Moving on. Solved this one in the wee hours last night, but lacked the energy to write about it afterward. My impression was that there were a bunch of excellent and clever clues. Let’s see how many I can find. ~Uh-oh… so many songs I want to include. 61a [Reassuring words on a train station board] ON TIME. 102a [Private entertainers’ initials] USO. 89d [Org. overseeing diamonds and clubs] MLB. Check out the conglomeration here: 26d [Churchill Downs event] DERBY, and then in the crossing row 31a [26-Down entrant] HORSE, 32a [Race participant] POL, 34a [Horace’s “__ Poetica”] ARS. Heck, there’s even 28d [Pumper part] HOSE crossing HORSE. Some fine long downs: 5d [Plus much more] AND THEN SOME, 13d [“We Are the Champions,” e.g.] ROCK ANTHEM, 71d [One who might deem a picture worth a thousand words] MOVIE CRITIC (not part of the theme; see also 120a [Hollywood figure] AGENT), 80d [Have lunch, casually] GRAB A BITE (also not part of the theme). 19a [Sandwich with pork, cheese and pickles] CUBAN. Cubano, really. Two clues that seem off to me: 46a [“Right back __!”] AT YOU; no, that wants either AT YA or ATCHA. 25d [Equal (with)] ON PAR; maybe it’s just me, but this should be ON A PAR. Google’s Ngram, however, suggests there’s room for ON PAR, and its popularity is rising. 74a [One often accompanies a trench coat] FEDORA. 1d [Gordon Ramsay, e.g.] Four letters. First I used CHEF, but that didn’t work, as the crossing 23a [Prayer starter] was O LORD. So, COOK, right? Nope, it’s SCOT. 1a [Kingdom mentioned in 1 Kings] SHEBA. I believe that’s “First Kings”, but as D Trump would say, “One Kings”, which is probably someone’s street address. 35a [Ref. that recently added “locavore” and “phablet”] OED. Gratuitous new vocabulary! I approve, even if I consider the words themselves kind of awful. 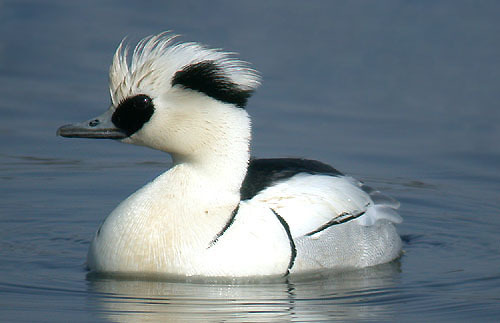 88a [Migratory duck] SMEW. 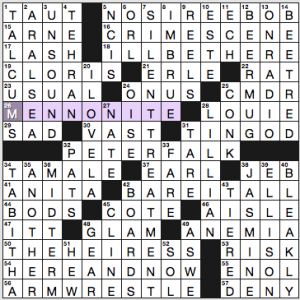 A crossword habitué that, by the way, catches and feeds on marine fish. Males have striking black-and-white patterning. Clever clues that some of us have seen too many times: 126a [Low digits] TOES, 40d [Burmese utterance] MEOW. 54d [Spanakopita ingredient] FETA. I just wanted to type spanakopita. Spanakopita, spanakopita, spanakopita. Not remarkable that the next clue (56d) is the Greek island that’s a [Tourist destination in the Ionian Sea] CORFU. Spanakopita, spanakopita, spanakopita. Not immensely thrilled with the theme, but it’s executed well, and the rest of the puzzle is pretty top-notch. I think that covers everything. Guess I went a bit overboard with links today. Hope you don’t mind. This entry was posted in Daily Puzzles and tagged Andrew J. Ries, Andrew Ries, Barry C. Silk, Brad Wilber, Roland Huget. Bookmark the permalink. My favorite answer in the NYT — TIN GOD. Toughest was IMBRUE for Stain! 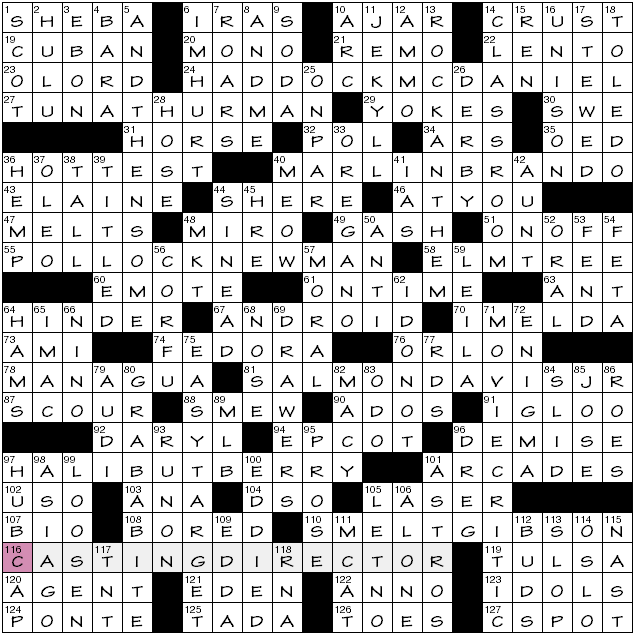 NYT fill was great, but ERLE & EARL in the same grid, without so much as a nod to each other in their clues, was disappointing. Also as a New Yorker I need to object to “Forget about it!” which can mean 17,000 different things (none of which are NO SIREE BOB). Also, it’s spelled “wrong.” It’s ‘fuggedaboudit’ or some variant thereupon. The changing of the guard in the crossword construction world has become particularly evident and pronounced in the last two or three months. I have never heard of many, if not most of the constructors, especially in the NYT. Please understand that I do not think that this is a bad thing; on the contrary, it is both good and inevitable. And most of the puzzles are excellent. One might almost say that the times, (!) they are a’changin’. Why is 45A “Animal shelter”=COTE ??? As in “dove cote.” A cote is generally a shelter for (avian) animals. I thought this was moderately difficult, but both weekend puzzles were much easier than last Friday’s. I did not know IMBRUE. Great word. I know ARM WRESTLE is in the language, so this is not a nit, but I think all the championship organizations call it WRIST WRESTLING. It reminds me a little of bowling, which when I was young, was though to be a game of the “fingers,” but is now recognized as a game of the wrist. While the puzzle was of only moderate difficulty for me, I was definitely not on the right wavelength for many of the clues. Fun puzzle, by the way. Yes, I wanted it to start with “Miss”… Having lived for a short while in the South, I liked this intermediate level of addressing people. In the middle east, if you have a Dr. title, they often use it with your first name– It sounds weird in English, but it’s an interesting compromise between being very familiar and very formal. There’s not in -between way to address people outside the south, right? (1) Have any of the constructors who made a “similar” puzzle been verified as real, or are they all pseudonyms so far as we know? (2) Why? What’s the motivating factor for a well-established editor to plagiarize puzzles? I can’t imagine it’s a financial thing. The pay for USA Today puzzles was quite cheap ($50 as I recall), but there still seemed to be a steady stream of submissions. Plus the puzzles are nothing special (I say that as somebody who has publish a dozen or so puzzles in USA Today over the years); they are the types of things a halfway decent constructor can crank out in short order. Copying just doesn’t make sense to me. Also, the unequivocal denouncement by Will Shortz and the fact that Mr. Parker makes it a point to state explicitly that he doesn’t like the New York Times puzzle make me wonder even more exactly what is going on. I suspect the dissing of the NYT puzzle derives from the years-ago interaction between Parker and Shortz. I don’t know all the details (was not in the crossword community yet), but I think it was basically an attempt to get Parker into the mainstream puzzle community … and he was not interested. Hmm… Interesting. Perhaps it is strictly a money thing then. It still seems like a relatively cheap price for one’s dignity. Very shady and unfortunate regardless. Oog, I got nailed on that FAUSTIAN/IRIS crossing; I had FAUSTEAN/ERIS :( And I know my Greek mythology too. I love all of Brad Wilber’s Newsday puzzles. He’s always got great fill. Today’s STUMPER was a masterpiece! LAT: Since George Clooney played title character Michael Clayton, it took me a very long time to realize George was not the correct answer! Fascinating article. Tim Parker does not come across as credible, I think. I was also disappointed (although not surprised) to find that Saul Pwanson was a legal name change. I so wanted to believe it was real! It’s real. There just aren’t a lot of Pwanson families out there, I imagine. I had assumed the name was an online moniker faintly obscuring a Paul Swanson. The legal name change is great!